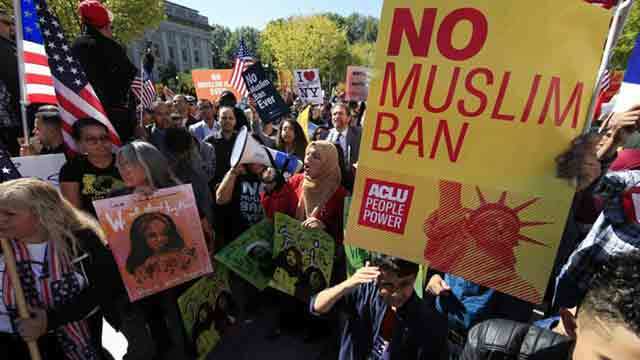 Washington, Dec 5 (Just News): The US Supreme Court said Monday that the government could fully enforce a revised ban on travelers from six mainly Muslim countries pending appeal, backing President Donald Trump in the year-long battle over the controversial measure. The court stayed October rulings from two lower courts that had blocked implementation of the ban on visitors from Chad, Iran, Libya, Somalia, Syria and Yemen while legal challenges to it continued. The third version of Trump’s travel ban, unveiled in September, drew immediate challenges in federal appeals courts in Richmond, Virginia and San Francisco, California. Plaintiffs argued that the measure targets Muslims in violation of the US Constitution and did not advance security goals as the government claimed. The challengers convinced the lower courts to put implementation on hold while they and government lawyers fight out the legality of the policy. But the Trump administration, which says the ban is crucial to protect US national security and deter terror attacks, secured strong support from the Supreme Court in a 7-2 vote to let the government move ahead while the appeals continue. “We are not surprised by today’s Supreme Court decision permitting immediate enforcement of the President’s proclamation limiting travel from countries presenting heightened risks of terrorism,” the White House said. “The proclamation is lawful and essential to protecting our homeland. We look forward to presenting a fuller defense of the proclamation as the pending cases work their way through the courts,” it added. The Council on American-Islamic Relations, the nation’s largest Muslim civil rights and advocacy organization, criticized the ruling. “This decision ignores the very real human consequences to American citizens and their families abroad imposed by President Trump’s Muslim Ban 3.0,” said CAIR National Litigation Director Lena Masri. The Supreme Court justices said they expect the lower appeals courts to expedite their decisions, leaving open the possibility that the policy could return to the Supreme Court in yet another legal challenge to the White House. The San Francisco court will hear the case on Wednesday and the Richmond court on Friday. The ban also covers people from North Korea and a selection of senior officials from Venezuela, but its main focus is travelers from the six mainly Muslim countries. Trump has battled to implement a travel ban since just after he became president on January 20, after having repeatedly promised during last year’s election campaign to ban all Muslims from entering the United States. Those promises have undermined the administration’s argument in a series of court challenges that its policy is not Muslim-focused but rather based on security needs. The initial ban was to be for 90 days, ostensibly to give the US and the targeted countries time to implement tougher and more thorough vetting procedures for visitors. After rolling court battles, the 90 day ban was finally allowed in June. Meanwhile, vetting for US-bound travelers from every country has intensified. But when the six-country ban expired in September, the administration sought to replace it with an open-ended ban, with Chad added to the list while Sudan was removed, and North Korea and Venezuela appended as well. Immigration and civil rights activists maintain it still essentially targets Muslims, which would violate the US Constitution’s guarantees of religious rights. When Trump last week retweeted three video clips from an extremist British group that vilified Muslims, his critics said it supported the idea that his immigration policies were anti-Muslim. “President Trump’s anti-Muslim prejudice is no secret-he has repeatedly confirmed it, including just last week on Twitter,” said Omar Jadwat, director of the Immigrants’ Rights Project at the American Civil Liberties Union.